Chris Lewis '20 (shown here against Princeton) scored a career-high 25 points against Penn on Saturday. 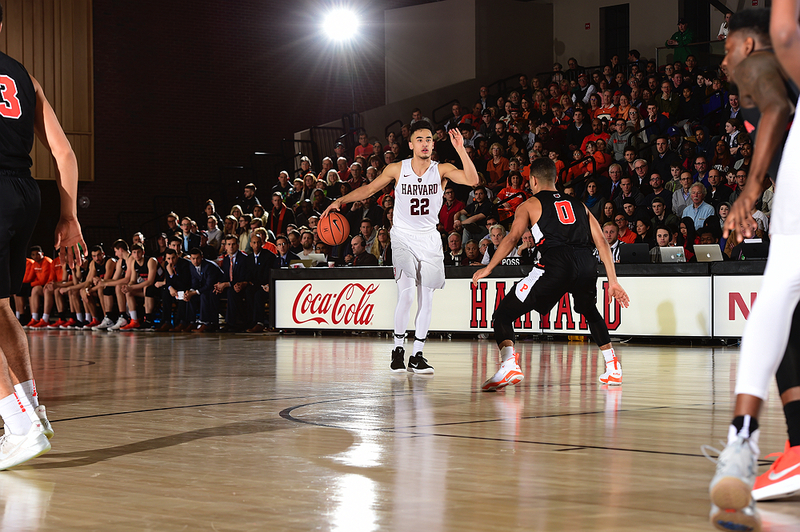 Christian Juzang '20 had a career-high 20 points in Harvard's win over Princeton. Henry Welsh '20 came off the bench to score five points, two of which came off this nifty finger roll, against Princeton. On Friday evening, an unusual sight greeted fans at Lavietes Pavilion: the 2018 NCAA men’s basketball national championship trophy was on display in the lobby, thanks to a promotion that is rotating the prize to one school in every conference in advance of March Madness. The notion of Harvard winning that tournament may be far-fetched, but at least one alumnus had a vision for what it would take to have a nationally competitive program. In March 2015, on the same weekend that the men’s basketball coaching position was endowed in his honor, Tom Stemberg ’71, M.B.A. ’73, suggested that the University already had two ingredients to become a national presence in men’s basketball: an excellent coach in Tommy Amaker, and an expanded financial-aid policy that helped Harvard compete for recruits with schools that could offer athletic scholarships. Stemberg—who acknowledged at the time that he did not think it realistic for Harvard to be a top-10 program—also identified a third factor that could enhance the Crimson’s brand: a more modern facility. This past weekend, Harvard moved closer to Stemberg’s vision. First, the new basketball court at Lavietes Pavilion was named in memory of the late alumnus as part of a celebration of the arena’s recent refurbishment . Second, the Crimson defeated Princeton (last year’s Ivy League champion) 66-51 on Friday and Penn (undefeated until then in Ivy play) 76-67 on Saturday to move into a tie with Penn for first place in the league. This young Crimson team (12-11 overall, 7-1 Ivy) remains a long way from making noise in the NCAA tournament, but heading into the final three weekends of conference play, it demonstrated the versatility, interior presence, and poise to make a run at its first Ivy title since 2015. When Amaker reeled in the nation’s tenth-ranked recruiting class in 2016, Henry Welsh ’20 was an afterthought in subsequent media coverage. He was the last member of the group to commit, and many captured his potential by mentioning that his older brother, Thomas, was the starting center for UCLA. Yet late in the first half of Friday’s game against Princeton, there was Welsh, barreling down the floor after making a steal. As he approached the basket, the big man used a Euro step (stepping right before going back to his left) to elude a defender and finish with a finger roll that upped the Crimson’s lead to 26-17. Welsh (who had five points and four rebounds in 15 minutes against Princeton) was one of several reserve players who proved essential this weekend. Another was Christian Juzang ’20. Typically a backup, Juzang started in place of injured point guard Bryce Aiken ’20 and played all but one minute across the two games; he also had a career-high and team-high 20 points against the Tigers. Finally, Danilo Djuricic ’21 came off the bench and scored nine points, sank a three, and played strong interior defense against Penn. Entering the season, much of the media’s focus was on the top-100 recruits on Harvard’s roster. And earlier this year, some questioned Amaker when he benched those stars. But this weekend offered the coach some vindication. Harvard’s roster is deep and versatile, which has enabled the Crimson to overcome injuries and foul trouble and wear down opponents. 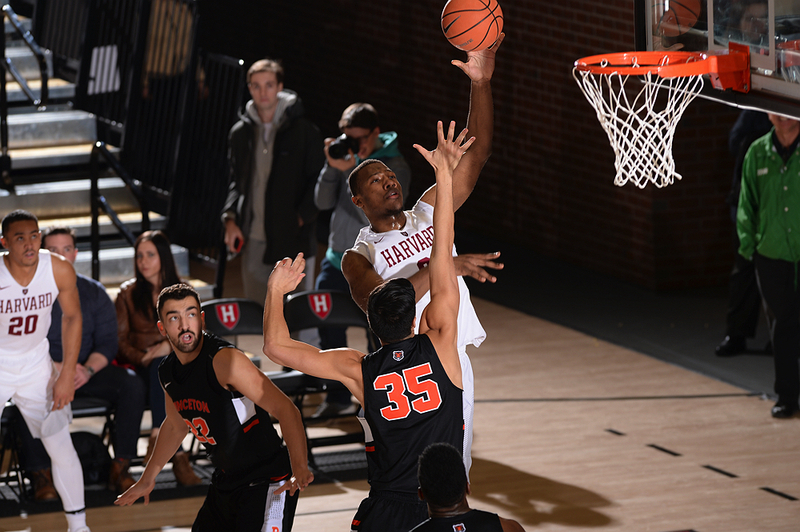 A little over a minute into Harvard’s game versus Penn on Saturday, Chris Lewis ’20 caught the ball in the paint, took two powerful dribbles, and finished with his left hand, giving Harvard its first bucket. On the Crimson’s next possession, Lewis—the team’s starting center and one of those top-100 recruits—received a pass from a slicing Justin Bassey ’20 and put it off the glass with his right hand. Those plays set the tone for the afternoon: Lewis finished with a career-high 25 points, five rebounds, and two blocks. He also made five of six attempts at the free throw line and passed the ball out of double team coverage, including a nifty dish to Djuricic halfway through the second half to extend the Crimson’s lead to 16. Amaker is adept at getting his teams to play within themselves. He emphasizes the importance of the program’s internal standards as opposed to external expectations. He also highlights the significance of embracing the process of continuously improving, telling the players, as Bassey has said, that they should focus on becoming a championship team, rather than winning a championship. Sustaining that equanimity has been hard this year. His players are young (the team starts four sophomores), have struggled with injuries and illness, and have spent an inordinate amount of time on the road. Nevertheless, despite this weekend’s distractions, including basketball alumni weekend events (see below) and a 4 p.m. start time for Saturday’s game, the Crimson showed impressive poise and cohesion, turning the ball over just six times against Penn and playing unselfishly on offense. A case in point came with about three and a half minutes left in Saturday’s game. The Quakers had just cut the deficit to eight (67-59), and Juzang brought the ball up the floor. 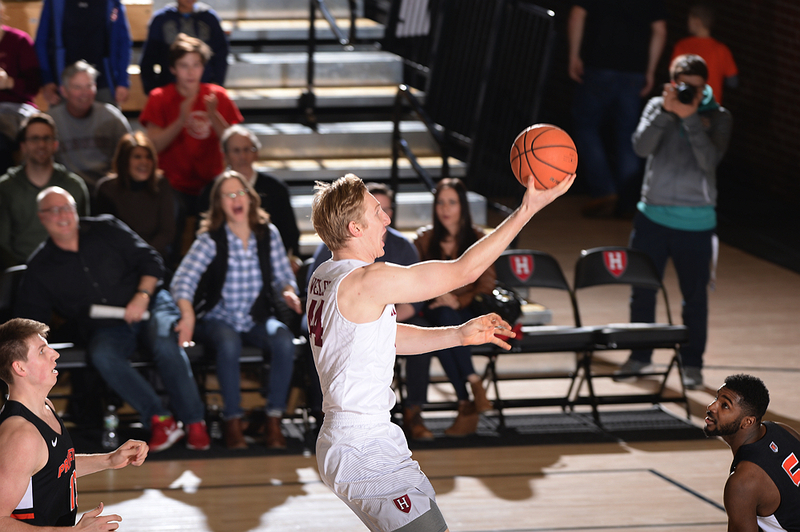 Over the course of the possession, all five Harvard players touched the ball, eventually leading to Corey Johnson ’19 swinging the ball back to Juzang in the corner for an open three that gave Harvard an 11-point lead. The Crimson will need to sustain that focus and energy next weekend as they host Brown and Yale, both 4-4 in Ivy play and looking to remain in position to qualify for the conference tournament. Prior to Friday’s game, Harvard Athletics formally named the Lavietes Pavilion court after Thomas Stemberg. Stemberg’s relationship with the program dates to his undergraduate days, when he covered the team for The Harvard Independent. After graduating from the Business School, he founded and became the longtime chairman of the Friends of Harvard Basketball, and in that position helped lead a fundraising effort that facilitated Amaker’s hiring in 2007. Stemberg passed away in October 2015, several months after the men’s basketball head coaching position was endowed in his family’s name. A Harvard Athletics news release covering Friday’s dedication stated that, “As part of the larger Lavietes Pavilion renewal project, 34 of Stemberg’s closest friends, Harvard classmates, and business partners came together to raise $10.6 million in his honor.” Before the on-court ceremony, those donors gathered for a reception at which Harvard president Drew Faust and Massachusetts governor—and former Harvard basketball player—Charlie Baker ’79 both spoke. The Harvard women’s basketball team got blown out in both its games this weekend, falling to Princeton 80-47 and Penn 69-49. The setbacks drop the Crimson (13-8 overall, 5-3 Ivy) into a tie with Yale for third place in the league. That makes next weekend’s games at Brown and Yale pivotal to Harvard’s effort to qualify for the Ivy League tournament.